The rigid simplicity of this view, however, as entered into a profound explanatory crisis in the last 20 years . It has done so, concomitantly with an interdisciplinary convergence (the second cybernetic, evolutionary epistemology, irreversible thermodynamics, cognitive science, neuroscience and neodarwinism, among others) from which a space is opening towards a completely different perspective : that of the sciences of complexity (Mahoney, 1991). The notion of sciences of complexity has emerged in these last years partly as a synthesis of certain traditional disciplines such as biology, physics and mathematics.  Complex systems (e.g. living beings, the brain or social systems) with which they occupy themselves are not encountered within only one traditional discipline, but rather the knowledge and the techniques of several disciplines is required for their study. This scene permits us to visualize a new collaboration among the “hard sciences” and the social sciences (such as psychology, psychopathology, sociology, anthropology) particularly when the latter, in the saying of Guidano, have a 20 to 30 year lag with respect to the first, a slowdown which obeys , as suggested by this writer , to the fact that the social sciences have not been preoccupied with epistemological aspects. To take an example from the “hard sciences”: In the last ten years physicists have clarified the phenomena which occurred when the Big Bang (the beginning of the Universe) exploded, and have even been able to reconstruct the events almost 14 seconds after the big blast. They have not done this by speculation, but through construction, explaining the processes and have arrived in a scientific language to speak of matters that are unthinkable to social scientists, as is the existence of antimatter; that is, to understand that matter exists solely because it floats in a sea of antimatter, of no matter. 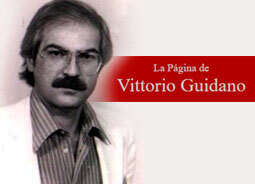 Accord to Guidano, this has been possible for physics because it has preserved its contact with epistemology. Now, as the sciences of complexity consider living organisms in terms of their complexity , there is from the very beginning an emphasis on self determination and self organization, as well as its open and plastic course of evolution and development. The basic element in this perspective is a mutation of the notion of reality and that of the observer. This has lead to a radical change in the relation observer-observed, in which the access to a unique and independent reality apart from the observer is no longer accepted, and on the contrary, as many realities as forms of living emerging from each being are proposed. 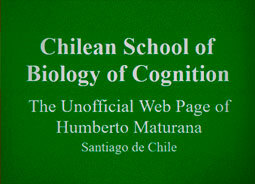 The contribution of Humberto Maturana , National Award in Biological Sciences 1994 , to the sciences of complexity is recognized; as well as his influence on the thought and research of many scientists related to them. When at the end of his life Bateson was asked who could continue with the study of the “Creature” , the world of living beings, he answered that the center for this analysis was now in Santiago de Chile, in charge of a man by the name of Humberto Maturana . In the same vein theoreticians and psychotherapists such as Guidano and Arciero, while referring specifically to Maturanas’ views, name him as the “Chilean School”. The most significant contributions to the sciences of complexity , have been the rejection of objective rationalism and representation in cognitive theories, the self-referentiality of all adaptation and knowledge, the emphasis of language on the construction of human experience and the involvement of knowledge with the total being, which challenges traditional dualism between mind and brain viewed as separate in the past. We previously suggested that interdisciplinary convergence has lead to epistemological changes in the relation observer-observed. The contribution of Maturana to this new epistemological proposition is fundamental. He is, to our knowledge, the first biological scientist to suggest that knowledge is a biological phenomenon that can only be studied and known as such. Furthermore, his proposition is that life itself should be understood as a process of knowledge which serves the organism for adaptation and survival. Maturana’s work , thus, can be characterized as a unitary and ontological explanatory system of life and experiencing. Ontological because it visualizes human experience from a point of view situated from within itself and not from an external view from the outside. As it emerges from his being a biologist, Maturana’s approach permits us to reflect in the broadest terms, in the sense that everything related to life can be explained from this standpoint. From this point of view psychology is part of biology since the phenomena it studies occur in the process of living of human beings. Although Maturana is willing to recognize its own domain, whose realm is the study of dynamic relationships and interactions occurring among whole organisms, his biological reasoning leads him to view the mind as an instance of life, as an organization within the organization of life itself. Life and mind are self-organizing; they are structurally determined systems, autopoietic (in the sense that live organisms are permanently self-creating) and self referential, in other words, circular (closed). Maturana also states that all change experienced by autopoietic systems are determined by its own organization and structure. Even though these two concepts are characteristic of live beings (as understood in Maturana’s terms “composite units of a particular class”) they are not synonymous. Organization refers to the relation among the components of a “composite unit” determining the properties of that unit. Structure, on the other hand, points to the actual components and the relation they have to satisfy while participating in the constitution of a “composite unit”. In other words, we, as living beings, maintain our organization during our entire lives; precisely to recognize ourselves as the same person from infancy to old age, is in relation to the fact that our organization has remained invariant. But structure is variable: it determines what changes are possible and what specific interactions are required to trigger those changes (the case, for instance , of an engineer, who at age 40 decides to dedicate his life to poetry). Thus, even though an entire system is operationally constituted by its organization, its effective operation is accomplished in -and through- its structure, in a way that, even though the domain (or space) of interactions of the system as a totality is specified by its organization, effective interactions occurr through its components. From this perspective, to state that systems are structurally determined implies that everything that occurs in them is not determined by anything external to them; and that if as observers we see something impinging on a systemn, it is not that which determines the change, but what triggers, within the system a structural change that was previously determined in its own configuration. In psychotherapy, this permits us to see that the changes a patient might experience are bounded by his organization, by his systemic identity (in other words, he will change only to the point that his organization will not be at risk). This way, psychotherapy always has a limit, and the bounderies are set by the patient, not by the therapist. Organizational closure refers to the fact that, once the characteristic unity of the living being is defined, it is capable of maintaining its integrity. Maturana states that the “bottom line” is to maintain our status as such , which is, to remain alive. Adaptation thus requires structural changes in the unity of living beings; and due to the fact that they are structurally determined and organizationally closed living systems are autonomous in the sense that they survive, prosper or are endangered under their own laws of doing. The organization of the live system is circular, self-referential, recursive and its organization is closed and therefore autonomous. This means , from a psychotherapeutic view point, that the patient will always be limited by his identity, that is, there will be no changes that go beyond his particular way of giving meaning to his experiences. The meaning continues to be the same. The structure changes, but not the organization. If, as Maturana points out, an independent objective reality from the observer is denied, and if as stated in his “Ontology of observing” , the observer is recongnized as a contitutive participant of what he observes, the change that is here proposed is evidently radical: the passage from a Universe, that is, an objective unique reality the same for everyone, to a Multiverse, in which every world constructed by the observer is equally valid and unique with respect to others. From the point of view of therapy, the existence of these two ways of conceptualizing psychological phenomena -and therefore the existence of two differing visions of what happens in the daily lives of those consulting us; of two differing conceptions of what occurs in the transformations taking place as a result of therapy- will imply two different ways of doing therapy. The first, if one believes that there exists a universe to which there is access, places the therapist in a privileged position; he is the bearer of truth that he believes he can transmit to the patient. In the other , the one suggested by Maturanas’ Multiverse, the therapist does not see himself as a bearer of truth, and will consider that the world constructed by his patient is the only possible world. Another of the most important contributions of Humberto Maturana is his theory of language; in fact, for theoretitians such as Guidano there is no other one as good and exhaustive. For Maturana, language, as a phenomenon of life, belongs to the evolutionary history of human beings. Humans are the first and only animals (concretely, primates) who have the peculiarity of living -in a constant , and uninterrupted flux- a simultaneous double dimension of experiencie: the first is immediate experience (emotions) , which occurs in all animals and according to which something simply happens to us; the second, which only occurs in human primates, is explanation, which takes place in language; only in language, for example, the existence of categories are admitted such as good and bad, justice and injustice, which permits us to understand that something which is taking place. Now, language consists of recurrent operations of what Maturana describe as recursives cosensual coordination of consensual coordination of behavior. Accordingly, each word or gesture is not related to anything external to us but with our occupation and our buisness with others. And it is precisely these occupations, and the emotions which lie at the bottom what specifies and gives the particular meaning to our words. Therefore, at a level of immediate experience we cannot distinguish between an illusion and a perception ; we only achieve this through language. As it is only through language that human beings can explain their experience in living and assimilate them to their praxis of life, to understand is inseparable from human experience; all the rational cognitive reordering that can be elaborated is based on tacit premises which have been furnished by immediate experience. In Maturana’s words: ” Every rational system has an emotional basis and this explains why it is not possible to convince anyone with a logical argument if an a priori acceptance has not been made beforehand”. From the point of view of therapy, this statement is an alternative to rationalist views which claim that through the practice of human logic it is possible to change the emotions of the patient. But, also, Maturana goes still further and coins the term languaging , with which he denominates the dynamic and functional relation which occurs in the immediate experience and the coordination of consensual actions with others, and explains that this languaging is constituted by the relation between emotions and language. This proposition reverts the classic empiricist standpoint which views language *as a simple transmission of information conveyed from one individual to another, a position that is today so ingrained that a change is not forseeable not even in the next decade. In this sense, Maturana’s proposition -with its emotional and not rational meaning- will have to be recognized as the most explanatory. In his ontologic view, languaging corresponds to an expression of human temporality; everything that occurs, occurs in language, in the here and the now. For Humberto Maturana, human experience takes place in the relational space of conversation. This means that, even though from a biological perspective we are homo sapiens sapiens , our way of living -that is to say, our human condition- takes place in our form of relating to each other and the world we configure in our daily lliving through conversation. Maturana is the first scientist who, from his work as such, explains love. In his proposition, love is not a quality or a gift, but as a relational biological phenomenon it consists of a behavior or class of behaviors through which another one, or the other, emerges as a legitimate other in the closeness of conviviality , in circunstances where another, or the other, could be oneself.. This, in the understanding that the others ‘ legitimacy is constituted by behaviors or operations that respect and accept his existence as it is, without effort and as a phenomenon of mere conhabitation. Legitimacy of the other and respect for him or her are two ways of relation congruent and complementary reciprocally implicated . Love is a biological phenomenon inherent to the animals relational scope, which in mammals appears as a central aspect of cohabiting in the intimacy of maternal – infant relation in total corporal acceptance. According to Maturana we get sick by living a way of life that systematically denies love. Maturana states that the therapeutic process is always the same, whatever the form of psychotherapy, and that it is achieved when the therapist succeeds, through his interaction with the patient, in guiding him, conducting him unconsciously , to abandon the systematic denial of himself and of others and in recovering the biology of love as the central way or central thread of his living. This manner of conceiving what is human by Humberto Maturana can have consequences as to a change in the experience of what is human that inevitably will lead to grant affectivity and emotions a greater importance , in decline on the emphasis on efficiency, achievement and technology which are so appreciated by modernism today.